It takes a lot more work to undo a behaviour that has been reinforced by enjoyable consequences than it does to cause it in the first place. 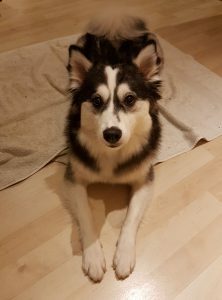 Freya is a beautiful one-year-old Pomski (cross between a Pomeranian and a Husky). She is friendly, gentle and adored. In most areas they have done really well with her. They have been very conscientious over training classes. There are, however, a few things that with a bit more experience of having a dog they may well have done a bit differently. The classes basically have taught ‘tricks’ – actions. They have not taught Freya self-control and they’ve not taught her young people the power of the consequences of their own actions. Freya is a great jumper-up. She jumps up for attention. The consequences? Fuss and attention! She jumps behind people when they are sitting down and climbs up their backs. She jumps on the sofa while they are eating. The consequences? She is given some food by the young man. (She will now go into her crate beside them with something nice to chew while they eat their meals). They have young relatives – little children. They are scared by a jumping dog. Unfortunately the couple can’t simply turn off a jumping-up switch when around children or visitors. Now they will do what they should have done to start with – reinforce feet on the floor with the desired consequences and teach Freya the behaviour that they do want instead. It’s the same for jumping up at the table and counter-surfing. We worked with a clicker. Freya quickly began to realise that jumping back down or even better, resisting jumping up at all, brought desirable consequences. A click and food. The ruling principal is now to concentrate on reinforcing and rewarding behaviours that they want. They will do their best to not reinforce or reward behaviours that they don’t want. Currently they have unwittingly but very effectively been teaching Freya the very things they don’t want her to do!